High-speed automobile accidents sometimes shear off or crush an arm or leg. Amputation can also occur at construction and other work sites. When this happens, victims undergo major negative changes. They lose major functionality, so that everyday tasks like writing, walking and feeding yourself become ordeals. Their ability to work comes into question. Their psychological sense of themselves suffers enormous damage. In accident situations involving an element of negligence, victims have a chance to recover financial damages for these injuries. While monetary compensation is no substitute for an arm or a leg (or significant eye or dental damage), it nevertheless pays your bills and provides some degree of satisfaction. Chambers & Noronha of Santa Ana, California, is among Southern California’s most respected personal injury law firms. While you rehab, our attorneys will pursue the key questions of your case. Was negligence a factor in the accident? Who was at fault? And what is the monetary value of your loss? 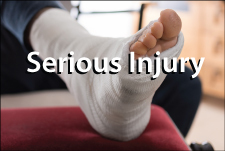 We pursue maximum compensation in cases of loss of limb and other catastrophic losses. We have been successful in obtaining rightful compensation even in cases where the victim acknowledges partial responsibility for the accident. Limb amputation makes individuals and their families financially vulnerable. Our job at Chambers & Noronha is to compensate you for your losses so that you can go forward with your life. Call 714-558-1400 with your questions — or ask us by email.